At the center of the philosophy of Heart is the entrepreneur's core values, those beliefs he holds to be good and important. Upon this foundation, the entrepreneur builds his brand, which, in the twenty-first century digital economy, is his authentic voice, his vision, his values, his meaning and his purpose. Heart is your intellectual and emotional energy. Heart is truth, integrity, and honesty. Heart is being true to yourself and your values. Your heart gives meaning to your life. Let it pervade through all you do and people will respond in kind. Heart-centered work is done for the purpose of making a profit as well as empowering people and improving communities. Heart is the highest expression of business. Heart will fulfill the desires of a company's employees, its shareholders, its customers and its community. A company operating with heart will be, Extraordinary. Your business's brand once meant little more than the logo on your letterhead. Today, with the advent of social media and vocal online customers, branding means so much more. In the twenty-first century, your brand is your voice, your vision, your values, your meaning, and your purpose; it’s now less about what you’re selling, and more about how people identify with what you believe. 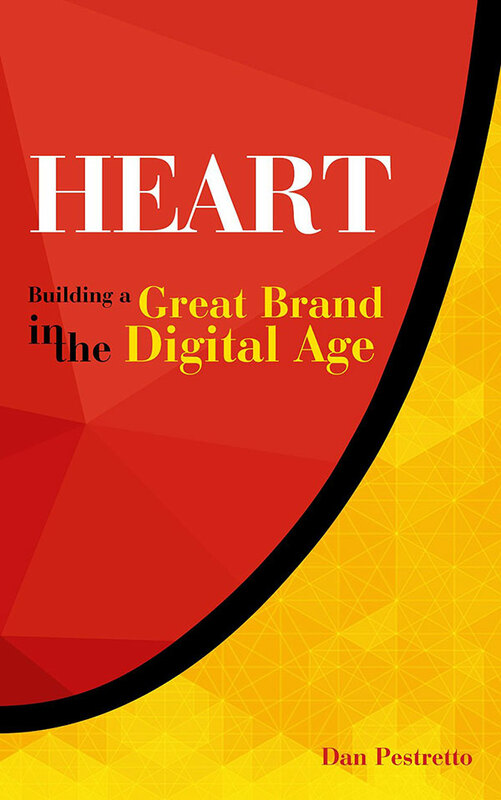 In Heart: Building a Great Brand in the Digital Age, entrepreneur and business consultant Dan Pestretto lays out a simple but powerful roadmap for growing your brand, based on his Principles of Heart. When you add your heart and passion into your business model, customers can't help but notice—and respond to—,your sincerity and vision. Truly believing in what you're doing strengthens your reputation, while putting your heart into customer service ensures consumers have a positive experience with your company—a vital component of branding in a world where one negative Tweet can ruin a brand's reputation in days. Thorough, insightful, and entertaining, Heart offers entrepreneurs a chance to reach out to the public, creating a connection that benefits businesses and customers alike. "Your book is the heart of the matter. It resonates with your joy, your love, your passion, your deep conviction that life and your business are about heart. To everyone who might be interested in getting their business to be great, read this book. Live it. With love." Michael E. Gerber author of The E-Myth books and Awakening the Entrepreneur Within. Systems Are Not the Answer. At least not the whole answer. The content of the blog portion of our website www.salespeople-on-demand.com is under copyleft. July 26, 2017 — Systems Are Not the Answer. At least not the whole answer. July 19, 2017 — To Life!